QuiltNSW has 4 general meetings a year and although I've been a member for a few years now I've never been to one. It seems I've always had something else on, work, sewing classes, places to be, things to see etc. Well, the stars were aligned this time around and I was able to attend. The meeting was held at the Burwood RSL. The venue was perfectly ostentatious. 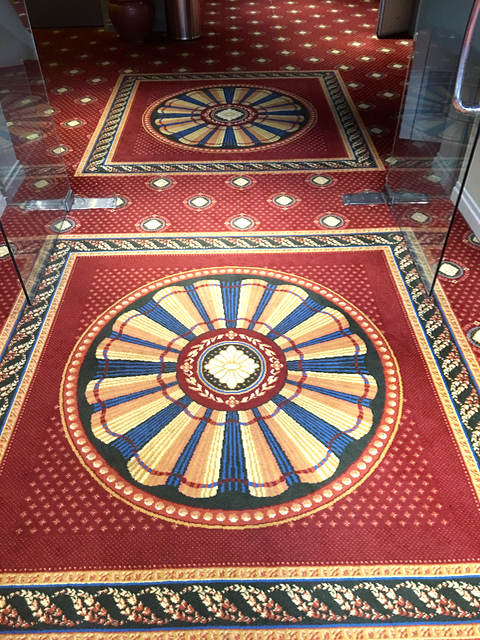 I approve of any place that has carpet that looks like a quilt! 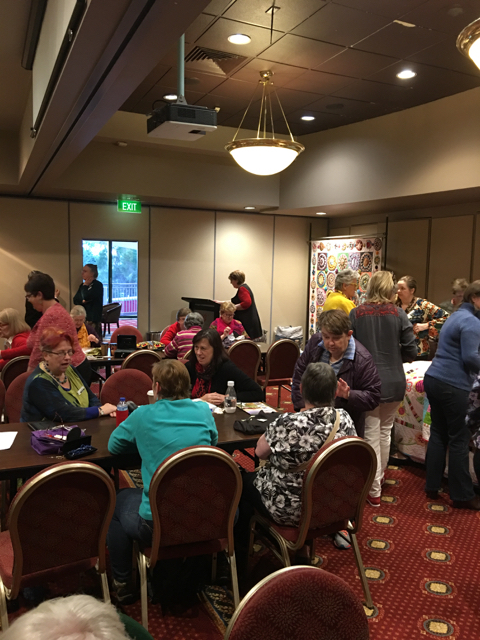 We were upstairs in a big room that soon filled up with the sound of nearly 90 happy, chatting quilters. The meeting started at 10am and moved at a steady pace all day. I was continually amazed at how many different things were fit into just 5 hours..
First up was a demonstration by Elaine Lye about how she makes her wonderful button necklaces. You can see Elaine's yellow button necklace in this photo. I couldn't help but think this green one could be a mermaid's magical seaweed necklace washed up on a beach. As you can see these necklaces are fabulous jumbly jiggling creations of mixed buttons and treasured trinkets. A clever thing about Elaine's design is that they be adjusted in length so suit different outfits. 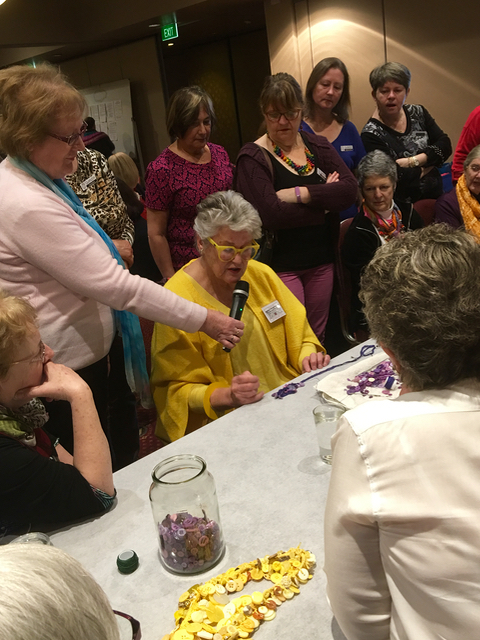 I was also interested in hearing her suggestions about sorting out buttons into colours and tips for washing them. Elaine usually teaches her button classes over a day but she managed to condense a lot of information into a short time. 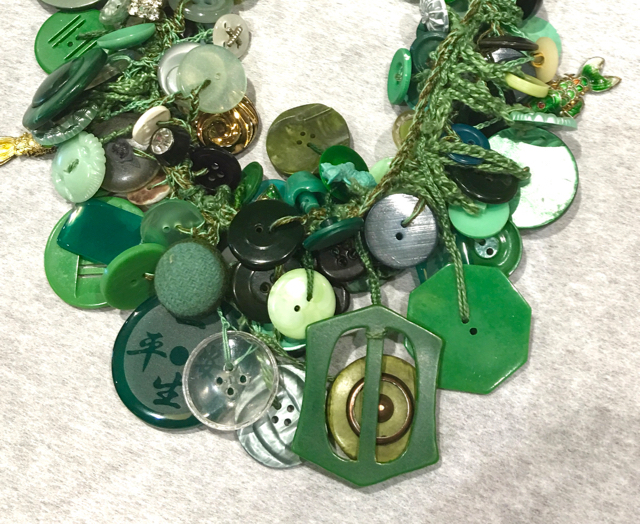 I wont be surprised if lots of quilters are wearing beautiful button necklaces to the next meeting. 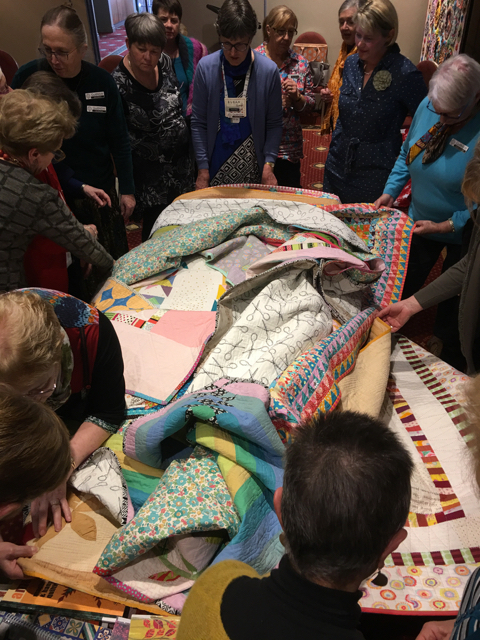 Soon the demonstration was over and in a blink of an eyelid the buttons were replaced by a table of quilts. What followed was the Eastern Suburbs Quilters doing a talk about their group. 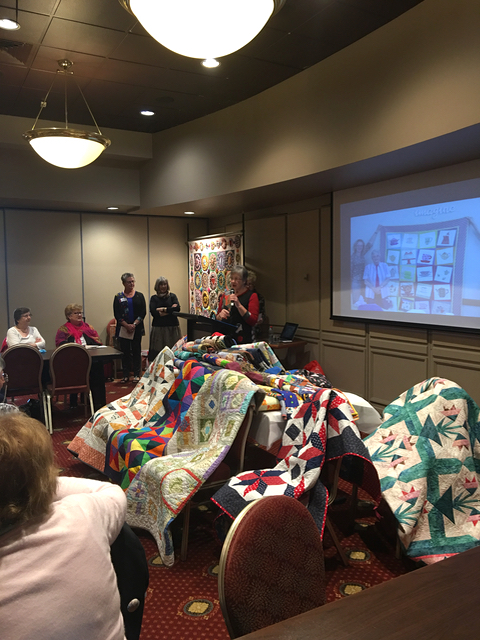 It was great to watch their slide show and learn about the activities they get up to, their workshops and hear about their community quilts. We were treated to a colourful parade of quilts the group had made. Lots of different styles and all wonderful. As you can imagine there were lots of Ooohs and Aaahhs from the crowd. Next on the agenda was the QuiltNSW committee meeting with different members reporting their news. Then before we knew it was lunch time. The Burwood RSL has a huge bistro with a menu that would make everybody happy. After lunch it was Sarah Fielkes turn with the microphone. 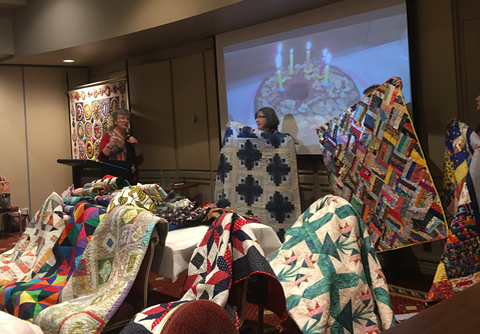 She talked of her quilting journey and then shared some of her favourite quilts. Once again day was efficiently ushered along and soon people were lining up with their show and tell. Beautiful quilt tops, quilts, flying butterflies and japanese bags all made an appearance. I was last in the show. I only talked for a short time about my quilt. I really just babbled about my quilt and before I knew it people were clapping and it was over. It was great answering questions. I've taken note of what people ask about my quilt so I can incorporate them into a proper talk about my quilt in case I'm ever ever asked to talk about it again. In fact when I got home I kept thinking of the photos I wished I'd taken. Oh well, here's my list of photos to get at the next meeting. *The Library books - At lunchtime tables were set up with lots and lots of quilt related books. Not only was it like being in a candy shop deciding which books to borrow, but it fun to see what others had chosen. 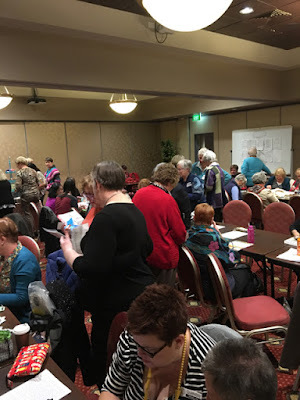 *Quilters with their hand sewing - If there's ever a place you're not going to get funny looks for sewing it's at a quilt meeting. * Lovely friends - happy smiles!! *The pop up shop - Kate Quilts had such a fun selection of pretty, modern and quirky fabrics. 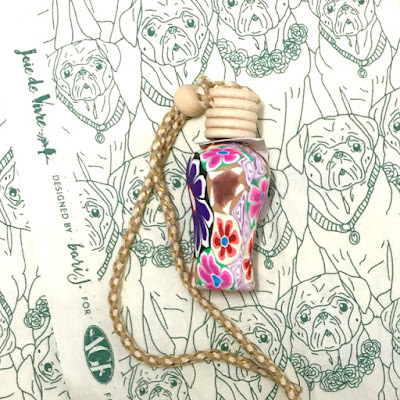 I'll leave you with a photo of what I bought at Kate's shop. 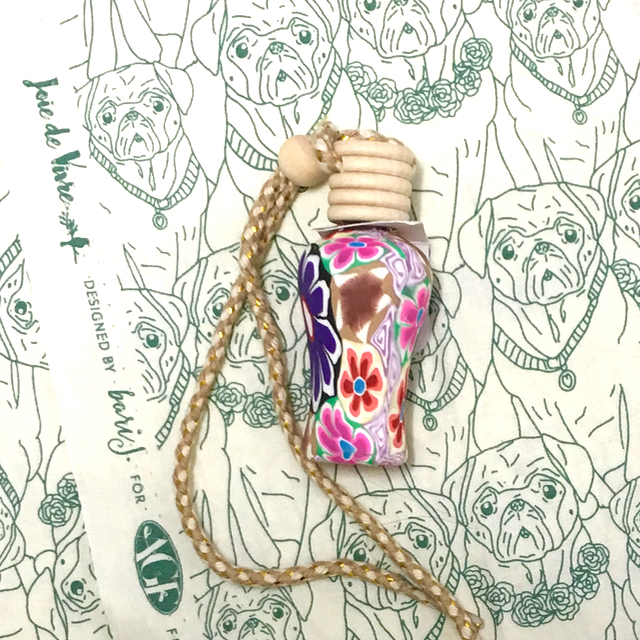 I was very restrained but couldn't resist these cute little pug faces and of course I couldn't live without needles in a colourful bottle. The piece with the big bee is very interesting. 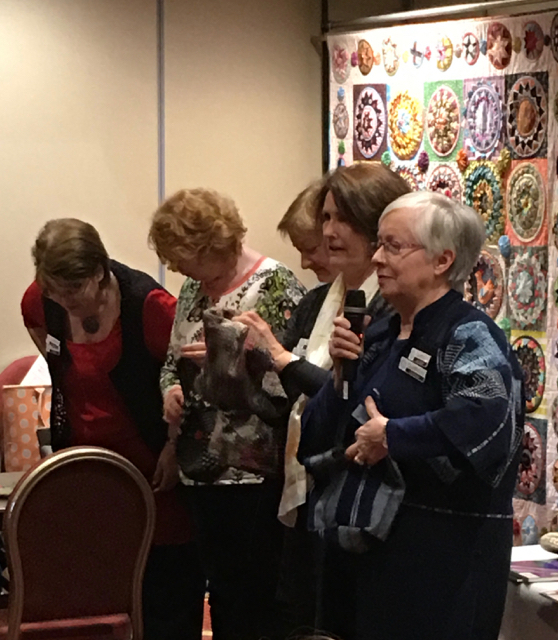 I have a photo of you talking with your quilt - I'll text it to you so you can add it! Sorry - I meant to do it earlier but then got caught up with visitors. Was such a fabulous day and I'm so glad I went. Hopefully I'll be able to go to another soon! And as always it was lovely seeing you again. Wow! You DO pack a lot in a meeting- a demonstration, show and tell, shopping, eating, and lots of fun! What fun! I'm sure everyone loved hearing about the process of making that spectacular quilt. Love the button necklaces. Guess I should start sorting! What a wonderful day!!! 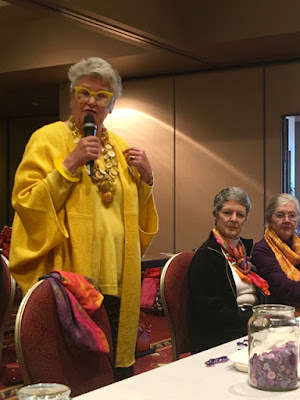 Love the button necklaces and the overall yellow theme from Elaine Lye! Lucky, lucky you listening to Sarah Fielke and wouldn't I just love to have seen her quilts up close. Pleased someone did get a photo of you with your quilt, looks lovely hang in up there. It looks like it was an amazing and fun day! 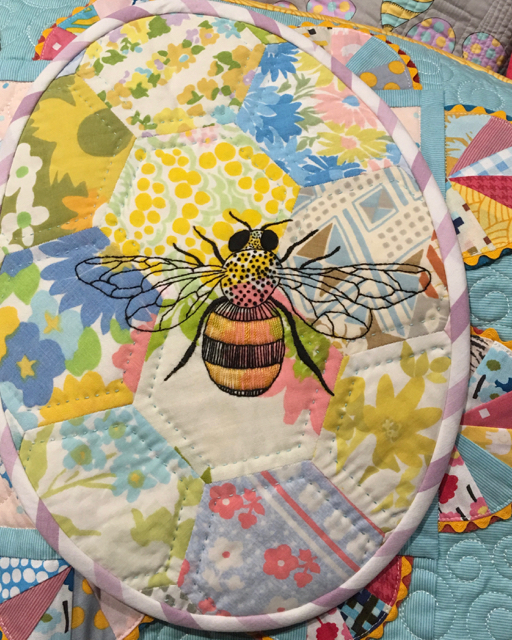 The button lady looks pretty sassy with her matching glasses and necklace and your quilt is beautiful too! Really glad you had a lovely day. Nice to see you with your quilt. Sounds like a fabulous day with a lot packed into it. I used to love the trunk shows they used to do on a Friday in the city. looks like a fun quilt meeting. I really enjoyed listened to Sarah's podcast recently. She's my kind of quilter - easy going and nice. How nice you had an opportunity to talk about your quilt. 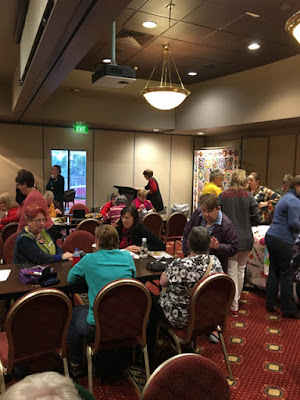 There's nothing be ter than spending the day with an enthusiastic group of quilters that included one of your imaginative and exciting pieces. Bzzzzz... Bzzzz....I can imagine the bees in the room ! This was certainly a fun quilt meeting ! Next time, ask to speak the first with your wonderful quilt ! Ah ah ! I am very crabby because I went to open house with three children...noisy and overwhelming..Home now to a glass of wine and a lovely post from Rachel...hmmmmmm peaceful..
Wow! This is an amazingly talented group! 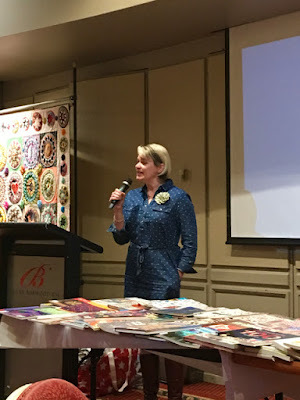 It shouldn't surprise me, given what I've seen of Australian quilts. 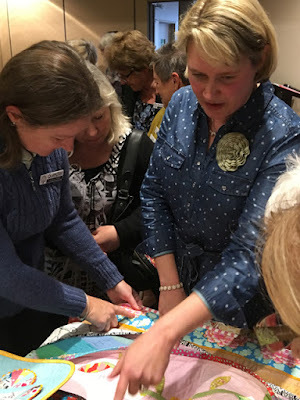 They were smart to show your quilt and to have you talk about it too! 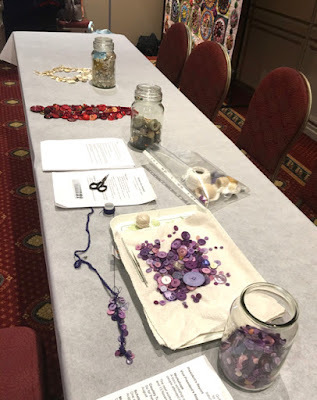 I would love to learn how to make those button necklaces. What fun! Wow, that was a lot in a short time! Looks like a busy day with lots of sharing! 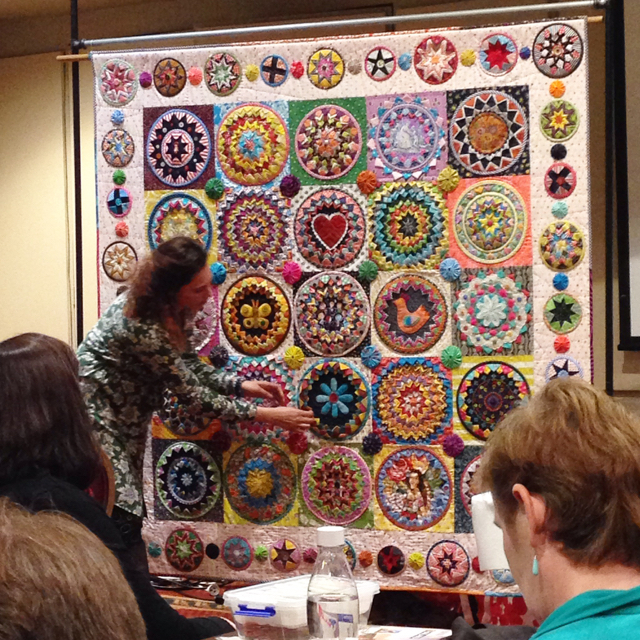 Wish I could have been there to admire your quilt up close! Thanks for the fun photos! What a great meeting. They do seem a very organised and busy bunch. Lovely to seer them covering so much in a single meeting. So pleased they had you as a guest as well.